On July 25, 2000, a Concorde, the world's fastest passenger plane, was taking off from Charles de Gaulle Airport in Paris when it suddenly burst into flames. An airliner capable of flying at more than twice the speed of sound, the Concorde had completed 25 years of successful flights, whisking wealthy passengers--from diplomats to rock stars to corporate titans--between continents on brief and glamorous flights. Yet on this fateful day, the chartered Concorde jet, en route to America, crashed and killed all 109 passengers and crew onboard and four people on the ground. Urgent questions immediately arose as investigators scrambled to discover what had gone wrong. What caused the fire? Could it have been prevented? And, most urgently, was the Concorde safe to fly? 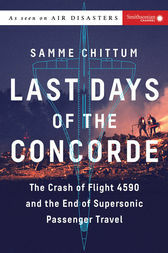 Last Days of the Concorde addresses these issues and many more, offering a fascinating insider's look at the dramatic disaster, the hunt for clues, and the systemic overhauls that followed the crash. SAMME CHITTUM is a narrative journalist and Pulitzer Traveling Fellowship recipient who explores the intersection of current events and history. Her work has been published in the New York Times, the New York Daily News, the New York Post, and the Village Voice. She is also the author of the first two books in the Smithsonian Air Disasters series, The Flight 981 Disaster and Southern Storm.